Norcross, GA – Rovema North America – a subsidiary of Rovema GmbH, which designs and supplies packaging machinery for the food industry – has a new website that offers a downloadable Vertical Bagging Operational Equipment Effectiveness (OEE) guide for Consumer Packaged Goods (CPG) manufacturers. Rovema created the 19-page guide to help small- and medium-sized businesses adopt the same best practices that multinational corporations rely on to optimize production efficiency. Vertical Form Fill and Seal (VFFS) baggers are critical components of many CPG manufacturing lines, but also can be the source of production frustrations and inefficiencies. Vertical baggers are prime targets for OEE improvement because, when not performing at optimal efficiency levels, they are often the bottleneck between product production and market readiness. 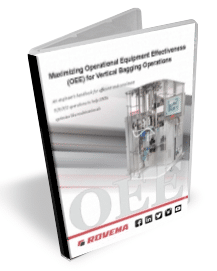 Rovema’s straightforward vertical bagging OEE handbook comprises a step-by-step playbook to enable maintenance, production or engineering teams to implement an OEE program for any VFFS line. Complete with checklists and sample worksheets, the guide can help companies achieve impressive operational improvements through enhanced equipment availability, performance and quality. The 19-page guide is available for download through Rovema’s vertical bagging educational resource center, located HERE.